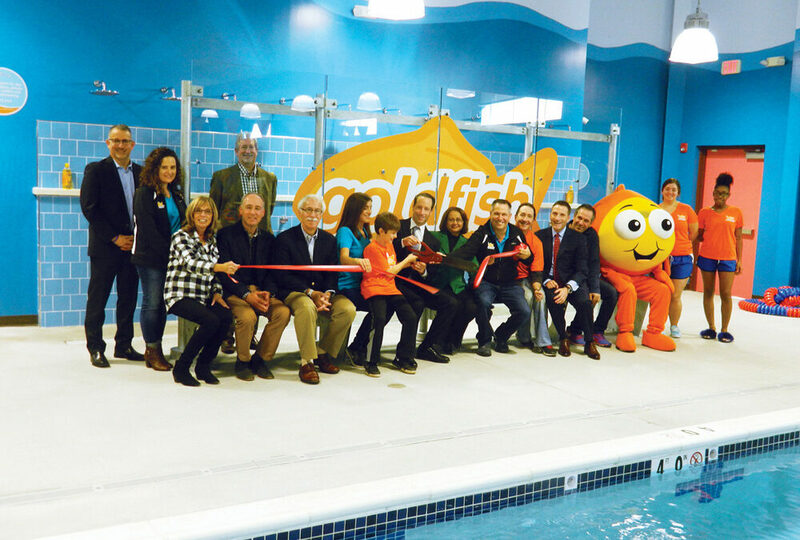 LIVINGSTON, N.J., – Goldfish Swim School, the country’s leading water safety and swim lesson school, recently celebrated the grand opening of its newest Garden State location at The Shoppes at the Livingston Circle in Livingston. Located at 277 Eisenhower Parkway, the 93,000-square-foot shopping center is managed and developed by Eastman Companies. The new 8,100-square-foot Goldfish Swim School facility provides swim instruction to children ages 4 months to 12 years. In addition to swim lessons, Goldfish Swim School of Livingston offers weekly family swims (for members and non-members) and party packages. Amenities include an air-conditioned viewing gallery for parents, a spacious family dressing area with private changing rooms, a snack bar and a retail shop. The addition of Goldfish Swim School enhances The Shoppes at Livingston Circle’s position as one of the area’s most dominant “one-stop shopping” destinations. Further diversifying the retail mix, premium indoor cycling chain CycleBar opened a new 3,200-square-foot studio at the center in September, and leases were recently signed with full-service restaurant Mezza Mediterranean (3,200 SF) and national Pilates franchise Club Pilates (1,730 SF). Eastman currently is marketing retail availabilities at The Shoppes ranging from 800 square feet to 15,000 square feet. Florian Suserman of Ripco Real Estate is the center’s exclusive leasing agent. The four new tenants join an impressive mix of national brands and locally owned favorites including Choice Pet Supply, Hand & Stone Massage and Facial Spa, Ike’s Bagel Café, Olive Garden, Wine Legend, M&T Bank and Zen Japanese Restaurant. Located at the intersection of Route 10 and Eisenhower Parkway, The Shoppes at the Livingston Circle serves a growing residential population of more than 150,000 within a five-mile radius. The marketplace offers an average household income of more than $171,000, and the daily traffic count exceeds 39,000 vehicles. The well-maintained property includes 469 parking spaces.